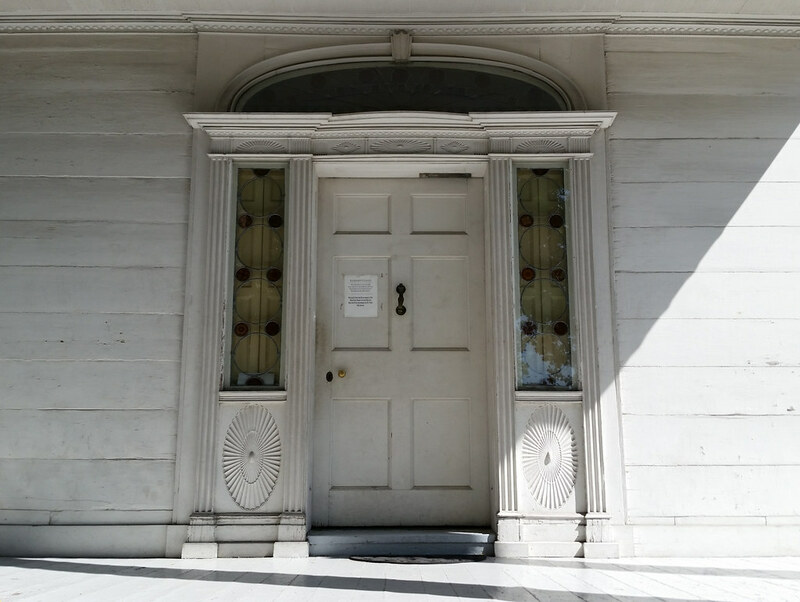 to the Morris-Jumel Mansion, Manhattan's oldest surviving house, which was indeed George Washington's headquarters for a few weeks in the fall of 1776 during the Revolutionary War. 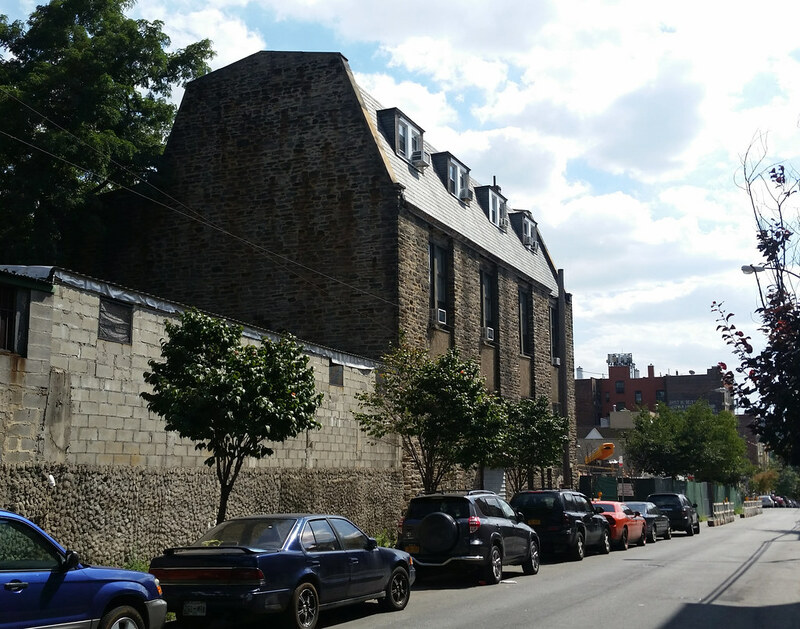 This building really stands out on this block, where it's the only one of 14 structures on the north side that's not a flat-fronted, five- or six-story apartment house. 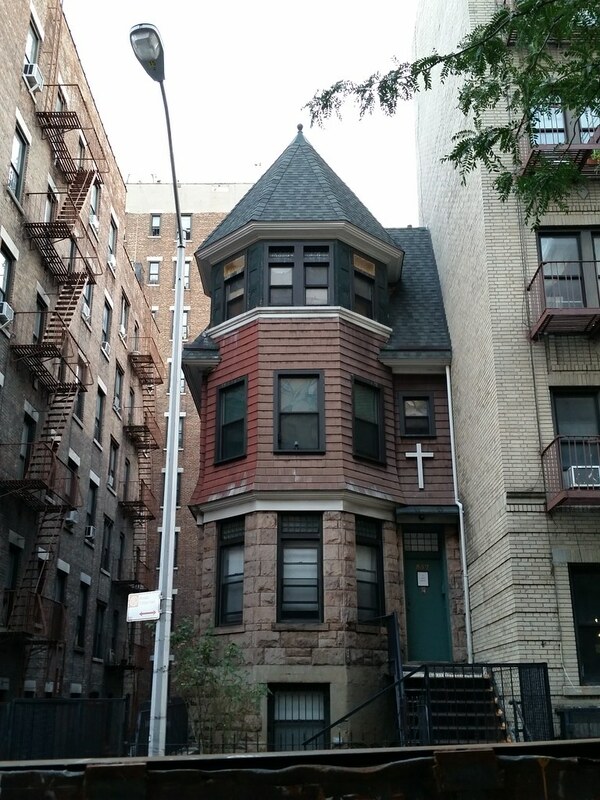 It was purchased in 1909 for future use as the rectory of the Church of Our Lady of Esperanza, which was completed in 1912 a block away on Audubon Terrace. A book about the church published in 1921 lists this address for the rectory, but a 1925 expansion project provided space for the rectory inside the church itself. This building is still owned by Our Lady of Esperanza, but I'm not sure what its function is these days. The illuminated apartment house in the background is Audubon Hall; the one in front is the Grinnell. Here's a circa 1910 photo of the Grinnell showing some decorative roof adornments that have since been removed. 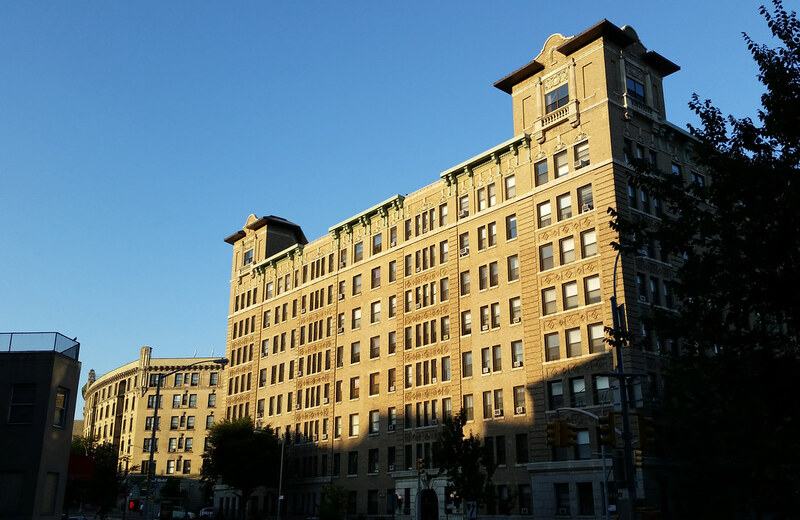 These buildings stand in a section of Washington Heights once known as Audubon Park, a residential area that grew out of the wooded estate (map) of the famed ornithologist and illustrator John James Audubon. (You can view online the full collection of Audubon's stunning illustrations from his landmark work Birds of America.) In the years after Audubon's death in 1851, his family gradually sold off their property; by 1873, most of Audubon Park was owned by the Grinnell family. The fittingly middle-named George Bird Grinnell was taught as a young boy by Audubon's widow, Lucy, and would go on to become a noted naturalist in his own right. Known to many as "the father of American conservation", he founded the original Audubon Society and was the driving force behind the creation of Glacier National Park. And, at left, a Famous Jimbo's Hamburger Palace. 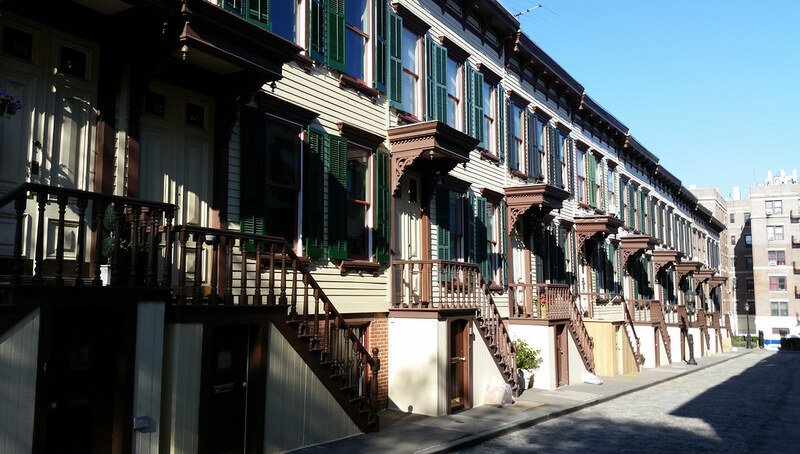 These charming wooden row houses, lining both sides of narrow Sylvan Terrace, were built around 1882 on what was then a private street carved out of the estate surrounding the Morris-Jumel Mansion. Today, with its identically painted facades and Belgian block pavement, Sylvan Terrace feels like a place out of time, especially when you're looking in the other direction toward the mansion. Check it out for yourself in Street View. UPDATE: You can see photos and floor plans of the interiors of a couple of these houses here and here. 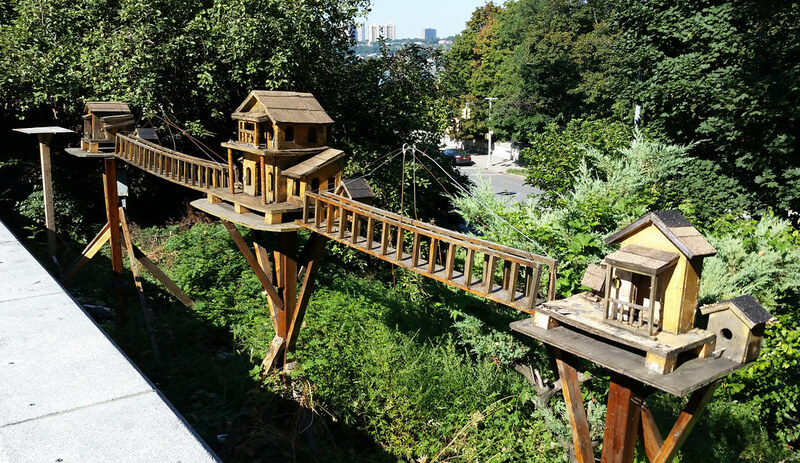 The smaller, classic-looking birdhouses, to the right of each of the more elaborate houses, were not originally included when this was built in 2011 or 2012. Perhaps they were added in concession to the reality that birds don't care much for the architectural sensibilities of humans. 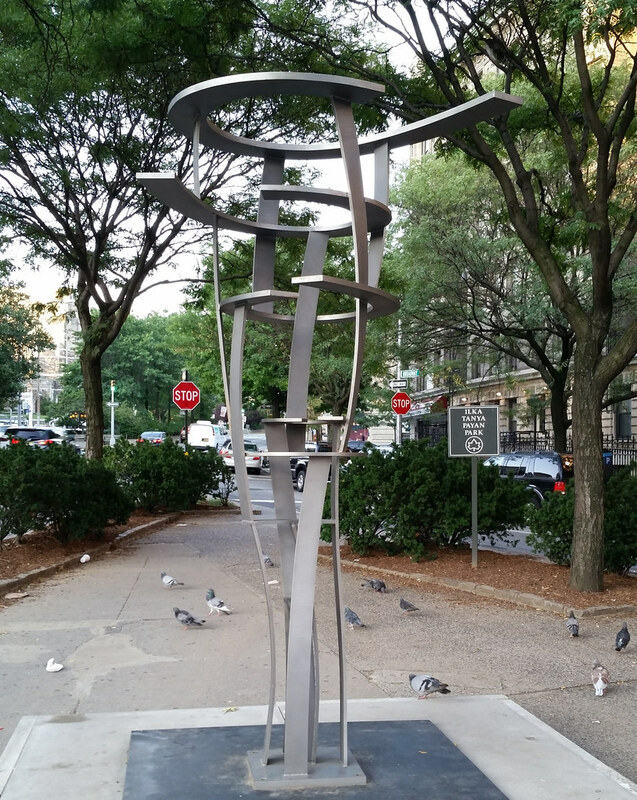 Or perhaps the whole thing was just intended to be a work of art and the birds were merely an afterthought. 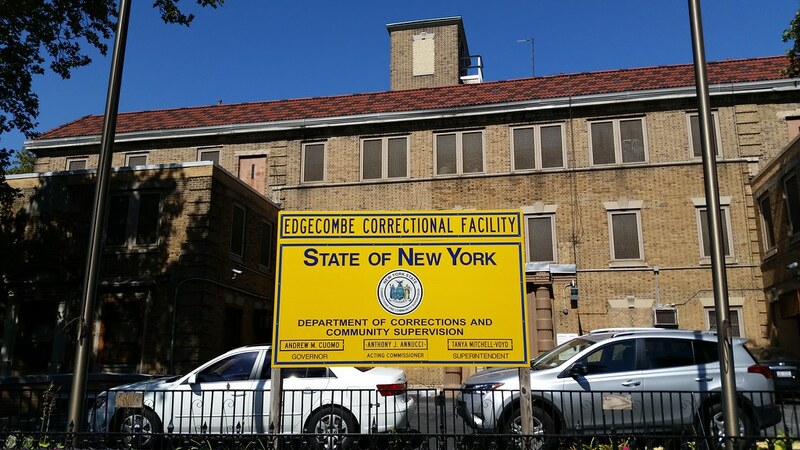 This minimum-security facility, known since 2010 as the Edgecombe Residential Treatment Facility, is located in the old Mother Cabrini Memorial Hospital. 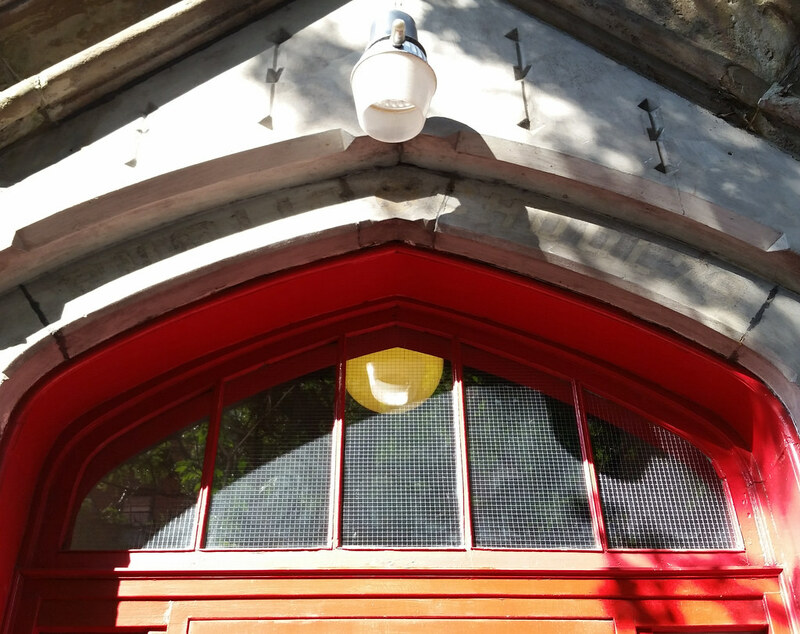 If you look closely, you can spot a caduceus above a door on 163rd Street. 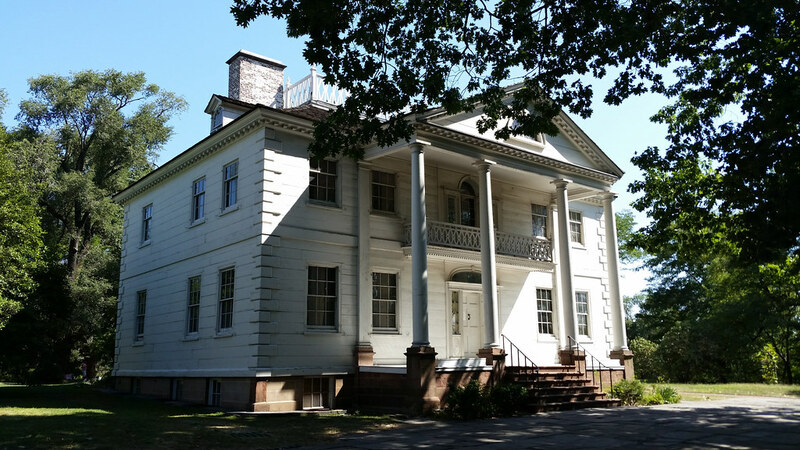 Built in 1765, this is Manhattan's oldest remaining house. 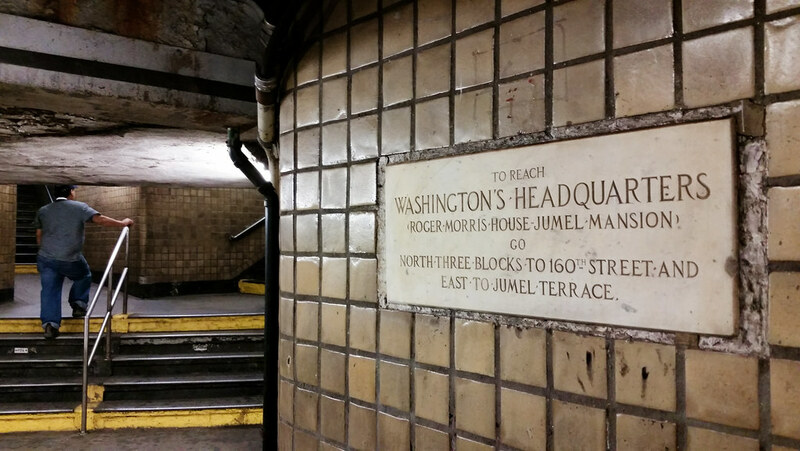 It served as General George Washington's headquarters — as noted in the subway — for about five weeks in the fall of 1776 during the Revolutionary War, and was subsequently taken over by the British and their Hessian allies after they drove the Americans from Manhattan. 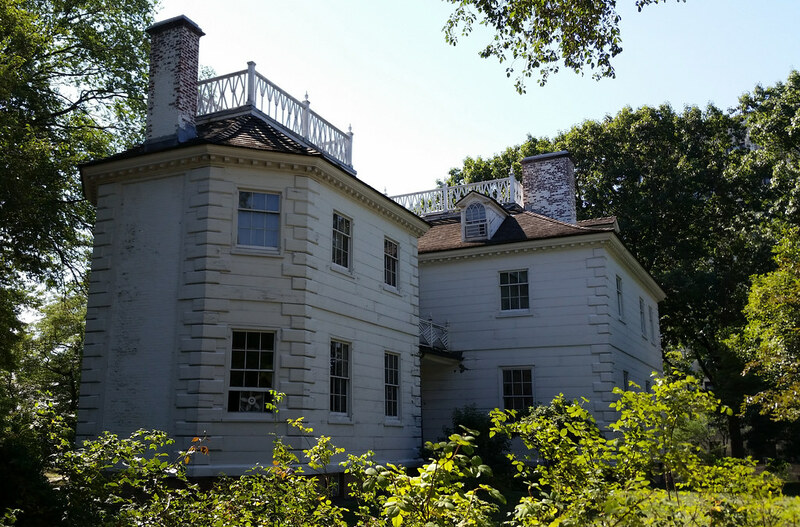 Stephen and Eliza Jumel purchased the mansion in 1810. Stephen passed away in 1832, but Eliza continued to live in the house until her own death in 1865. One notable resident during her time here was the elderly former Vice President Aaron Burr, Alexander Hamilton's killer, who married Eliza (Jumel, not Hamilton) in 1833. The marriage, strained by Burr's financial irresponsibility, did not last very long, however. Eliza filed for divorce on July 11, 1834, the 30th anniversary of Burr's duel with Hamilton, and was represented in the proceedings, as she had been in legal matters years before, by Alexander Hamilton Jr., Hamilton's son. Burr stalled as long as he could, but the divorce was finally granted a couple of months before he died in Staten Island in 1836. While he was working on his musical Hamilton, Lin-Manuel Miranda spent time here at the mansion, writing in Burr's old bedroom. 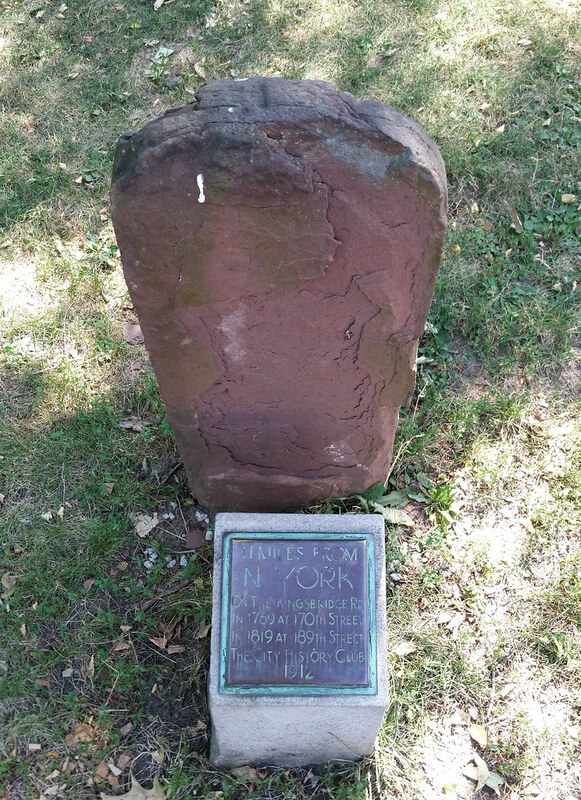 This old milestone, which stood on the Kingsbridge Road at least as far back as 1813, is now located on the grounds of the Morris-Jumel Mansion. 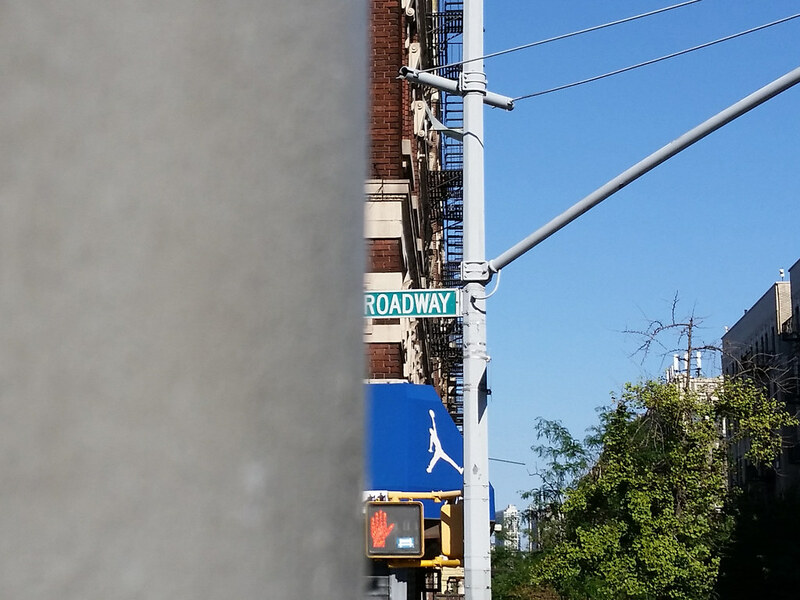 Of the perhaps 40 or 50 milestones that once marked distances along various roadways in what is now NYC, this one is, to the best of my knowledge, one of only four originals that can still be found outdoors in the city. 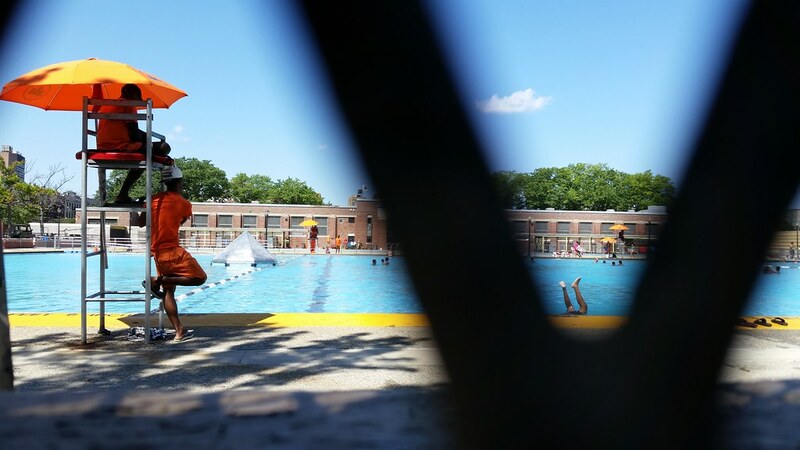 This pool in Highbridge Park was one of eleven massive, WPA-built outdoor pools that the city opened in 1936. 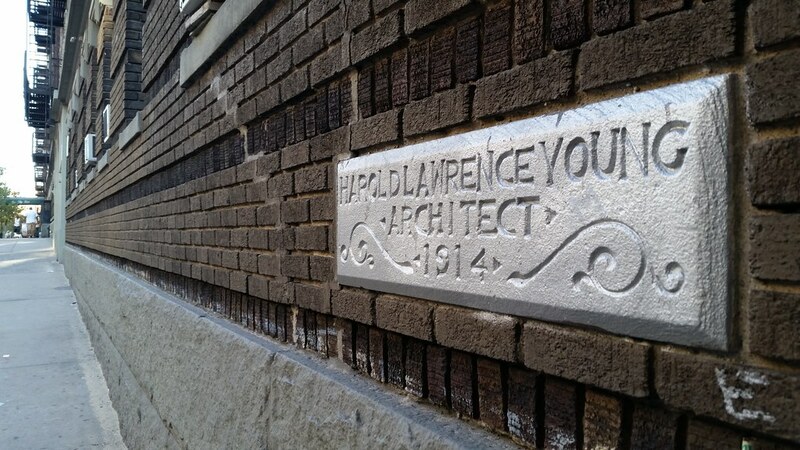 It was constructed on the site of the old High Bridge reservoir. You can see photos of the reservoir's demolition in 1934 here. 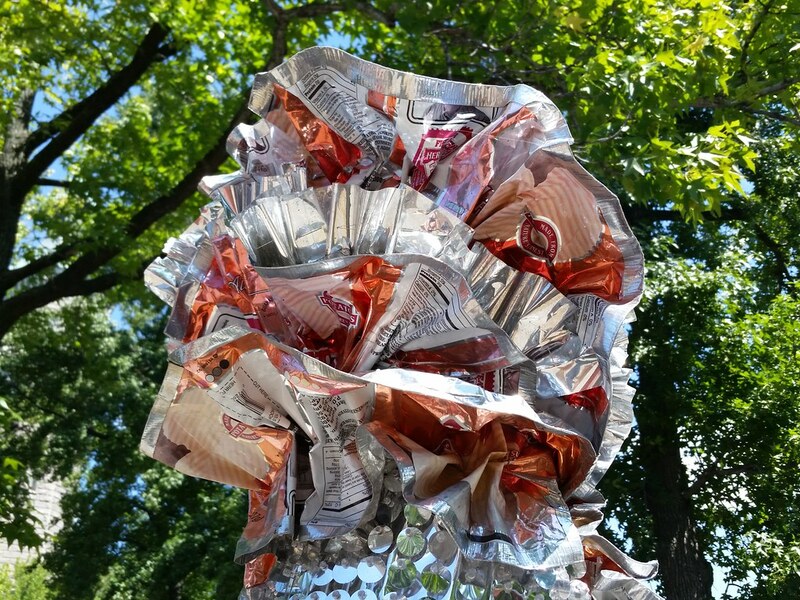 This intriguing Herb Rosenberg piece, whose not-so-intriguing title — A horse named NSA - Keeping an eye on you — sounds like a description of a bad political cartoon, is part of an exhibition in Highbridge Park called Oh Sit! 14 Sculptors Consider the Chair. 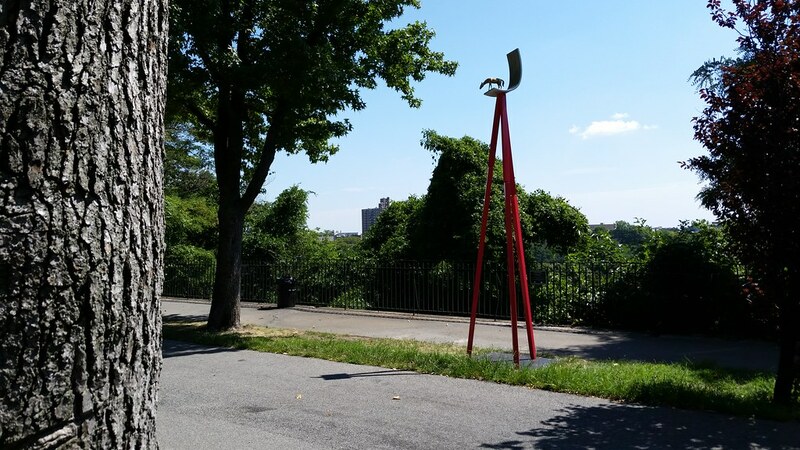 From the Parks Department's website, some more great artspeak: "Oh Sit! is framed as an imperative, a command—a way of asking the viewer to look and really consider the concept 'chair' both objectively and subjectively." 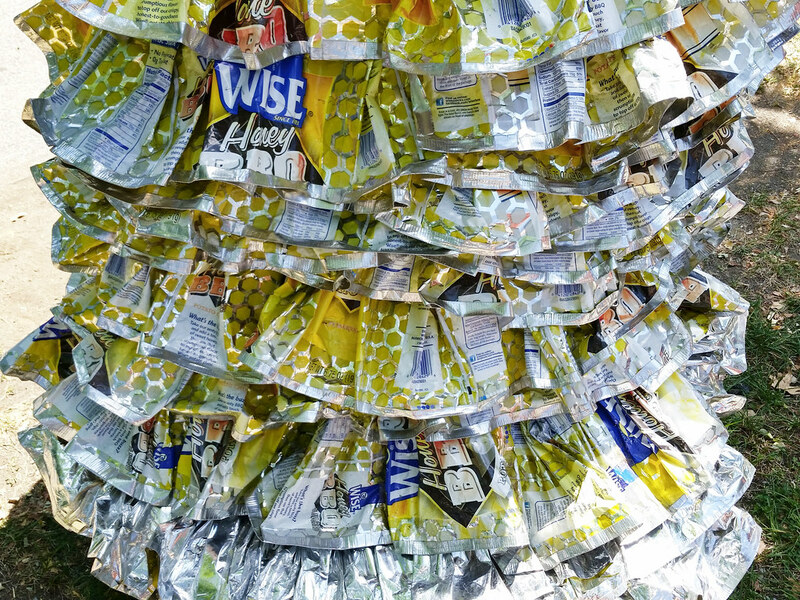 This sculpture by Christina Jorge, much of which is made of potato chip bags, is also part of the Oh Sit! 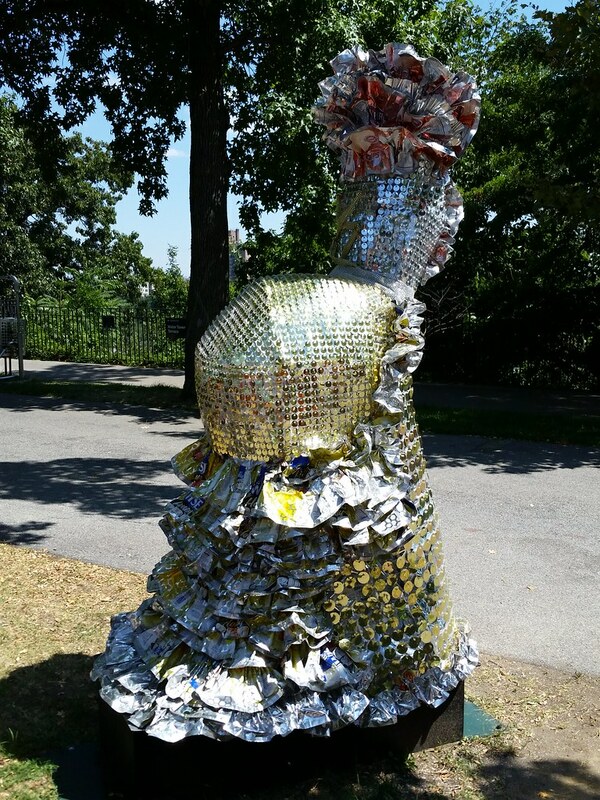 exhibition in Highbridge Park. Its title is a play on Sunday in the Park with George, the musical inspired by Georges Seurat's pointillist masterpiece A Sunday Afternoon on the Island of La Grande Jatte. 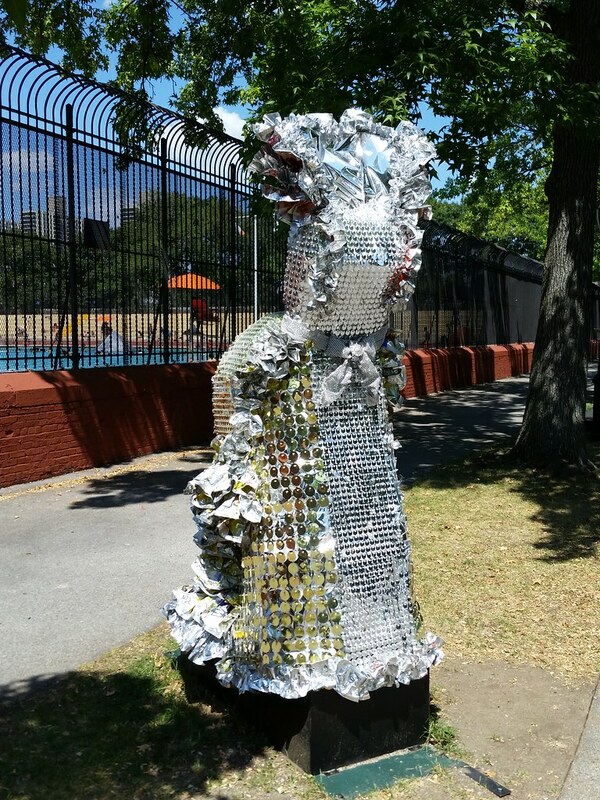 Jorge's potato chip lady is something of a bodega-fied version of the most prominent figure in Seurat's painting, a fashionable female parkgoer sporting a rather voluminous bustle (who also happens to have a pet monkey in tow). 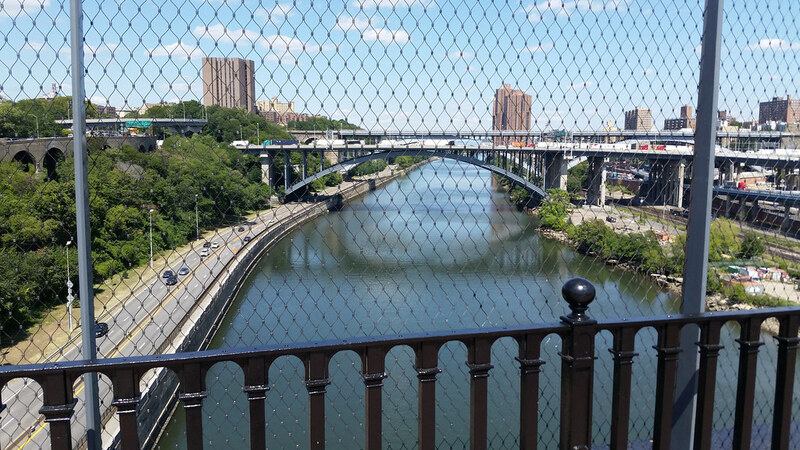 Standing beneath the Alexander Hamilton Bridge, we're looking across the Harlem River into the Bronx. 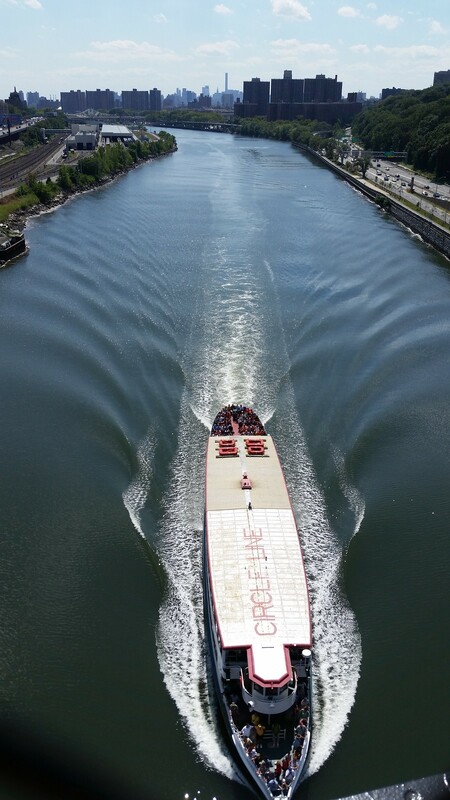 Visible to the left (north) is the Washington Bridge (not to be confused with the nearby George Washington Bridge). 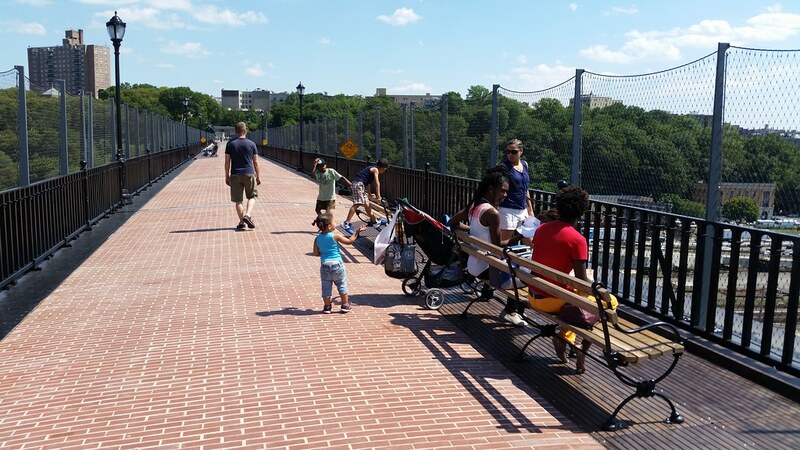 After some 40 years or more, the High Bridge is finally open to the public again. Unfortunately, it's now enclosed by tall, ugly safety fencing running the entire length of the structure. 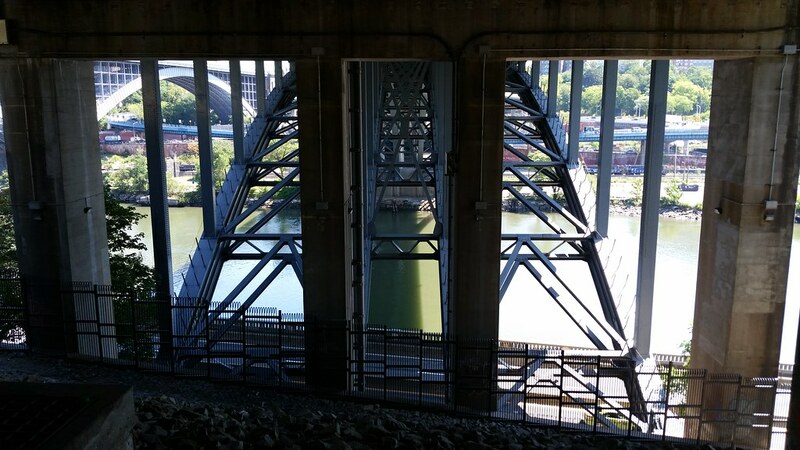 The bridge was completed in 1848, its stone arches carrying the Croton Aqueduct (located inside it), a desperately needed artery of fresh water and tremendous feat of civil engineering, across the Harlem River into Manhattan in monumental fashion. 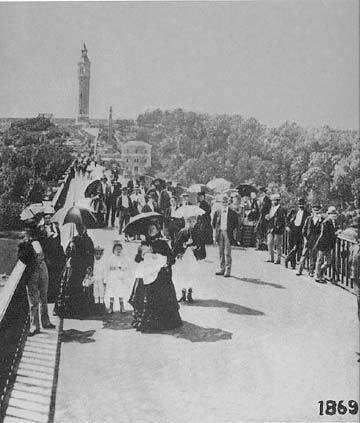 It became a popular sightseeing destination; well-dressed promenaders would come to stroll along the bridge's pedestrian walkway and take in the sweeping views of the Harlem River Valley. Starting in the 1960s or '70s, the bridge, no longer used to carry water, was closed to the public. An oft-repeated story is that it was gated off because people had been throwing things from the bridge at ships passing below — and there was at least one well-documented instance of that happening with a Circle Line tour boat in 1958 — but I suspect the city just didn't want to spend the money to maintain and secure an aging, pedestrian-only structure in a poor, high-crime area. 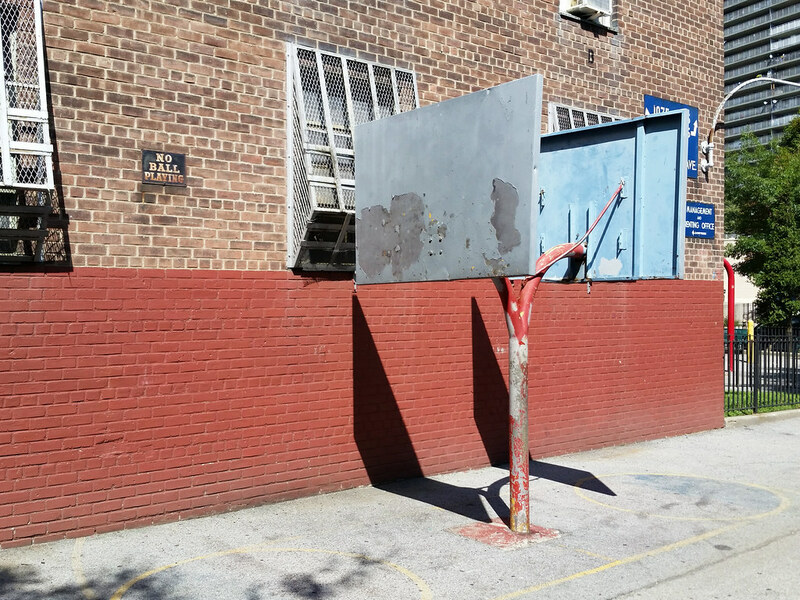 Even during the years it was closed, however, the bridge did continue to serve one small local population: kids from the Bronx who would climb around the gates and cross it to get to the Highbridge Park swimming pool on the other side in Manhattan. 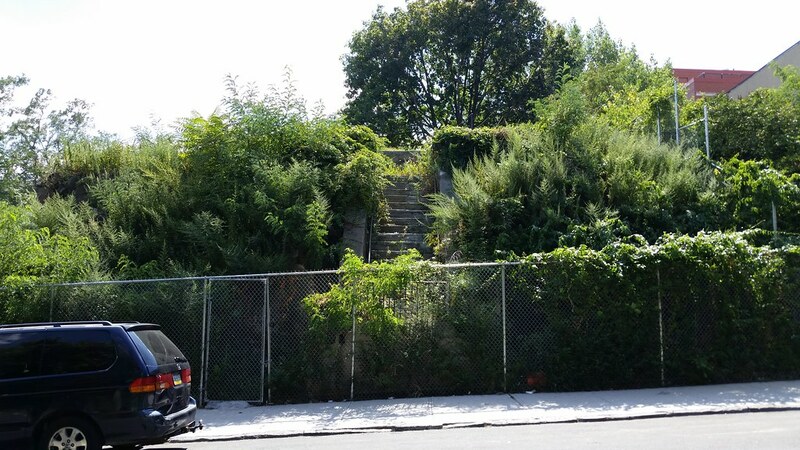 It wasn't too long ago that there was a house — two conjoined houses, actually — standing at the top of these stairs. The structures were torn down in 2014 after suffering extensive fire damage. The tree stabber’s last hurrah? I've said it before and I'll probably say it again: This may be the final one of these signs that I'll see on this walk. 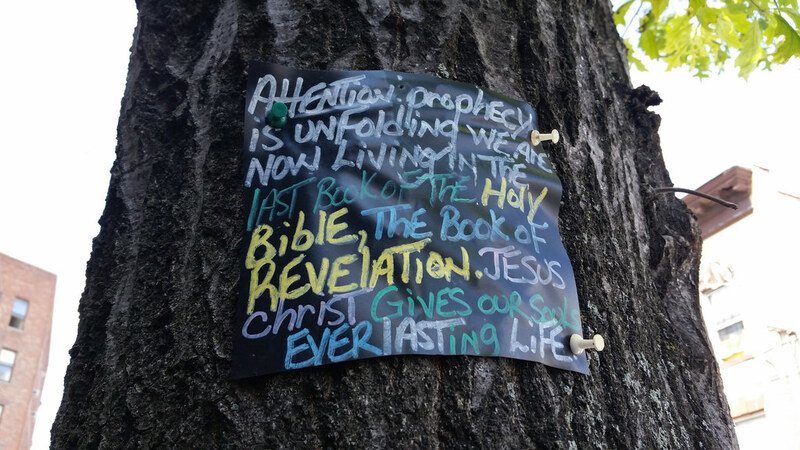 I've covered essentially all of the substantial territory (in the Bronx and Harlem) where the hundreds of other such signs can be found, but I'll likely end up coming back a couple of more times to walk new streets/paths or little bits I've missed. Sacred Heart, a Roman Catholic parish, purchased the building in 1943 and renovated it, naming the refurbished chapel St. Eugene's. Records from that time indicate the building also contained classrooms. Sacred Heart still owns the building today, although I'm not sure how or if it's currently being used. 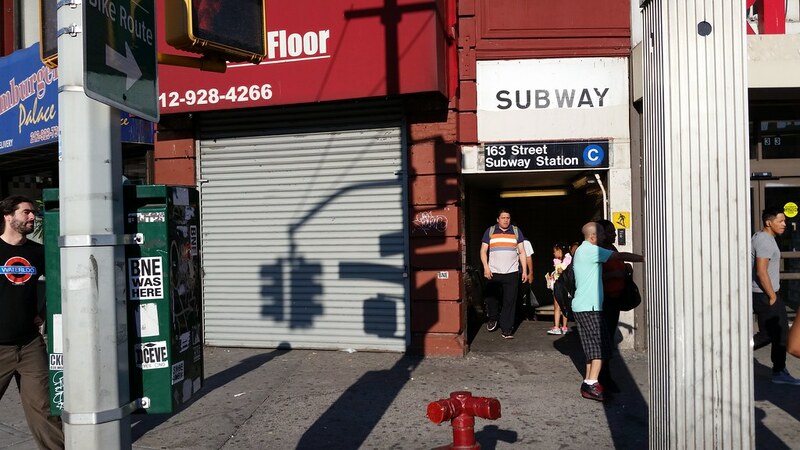 Until recently, it was home to the main office of the Highbridge Community Life Center, a community services organization founded by nuns that operated from the late 1970s until 2014. The center made the news in 1987 when Nicaraguan president Daniel Ortega attended a fiesta here while he was in town for the United Nations General Assembly (where he had forcefully denounced President Reagan in a speech the day before). 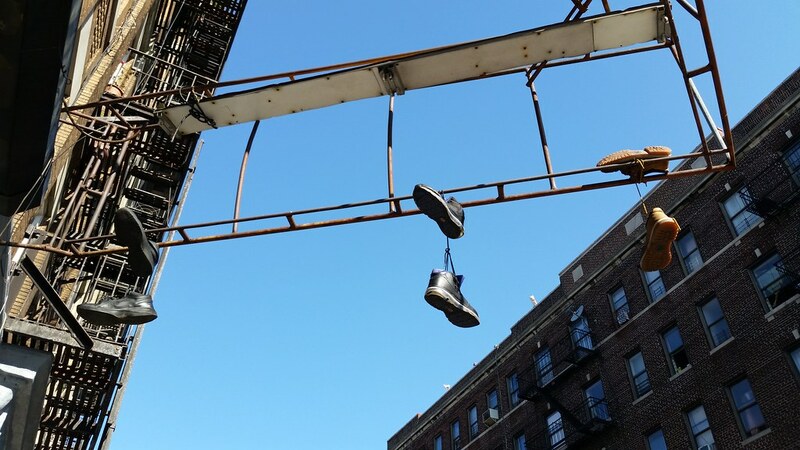 The center's director told the NY Times: "I had heard he was looking for a place like the Bronx where he might - you know - hang out with some poor people . . . So we asked him over." UPDATE (Aug. 24, 2017): Sacred Heart has sold the building and the surrounding lot to a developer. This is the first time in more than a century that the property has not been owned by a church. 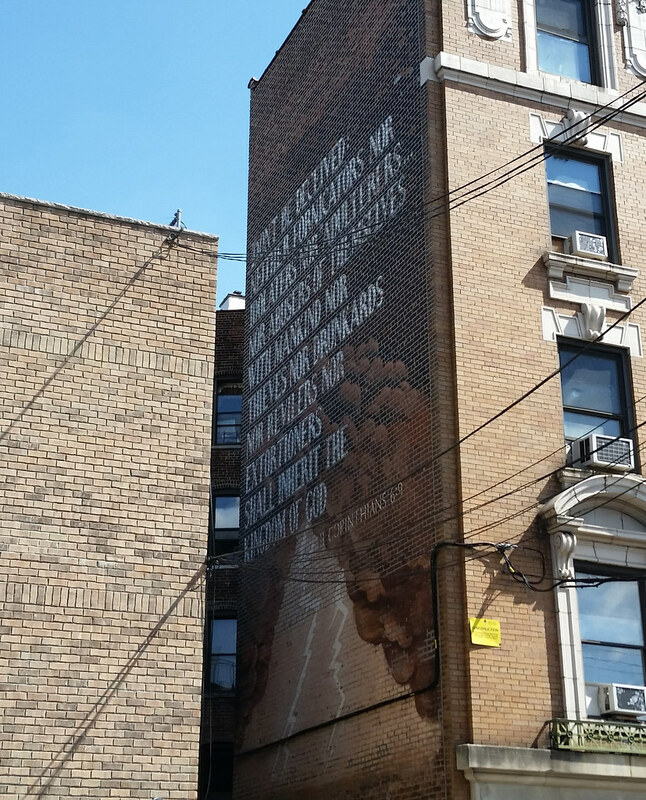 Emblazoned on the wall of this apartment building (zoom in) is a somewhat abridged version of the much-debated Bible passage 1 Corinthians 6:9-10 (not "II Corinthians 6:9", as the mural states). 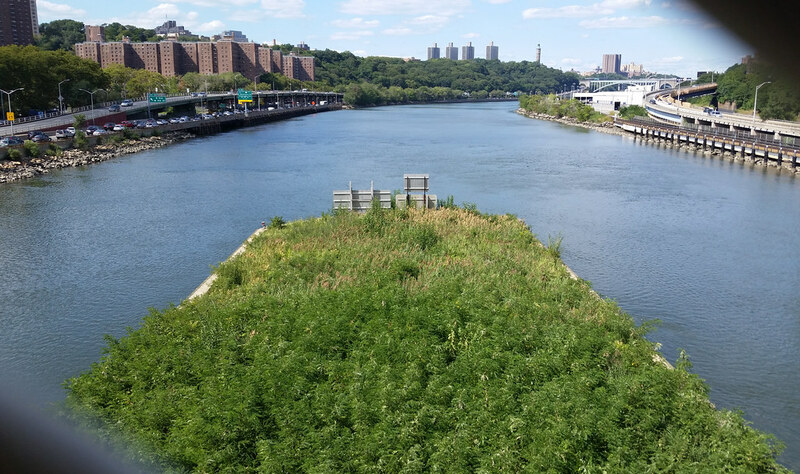 This is what late August* looks like on the artificial island built around the central pier of the Macombs Dam Bridge, one of the seven swing bridges over the Harlem River that can pivot open to allow large watercraft to pass by. Each of the seven bridges has a water-level structure that lines up with the movable span of the bridge when it's swung open, but this is the only one of those structures that is filled in with soil. Visible in the far distance are some northern Manhattan landmarks. From left to right: the Four Sisters (Bridge Apartments), the High Bridge Water Tower, and Yeshiva University's Belfer Hall, with the High Bridge in front of it. * You can use Street View to inspect the vegetation (or lack thereof) at various points over the past several years. 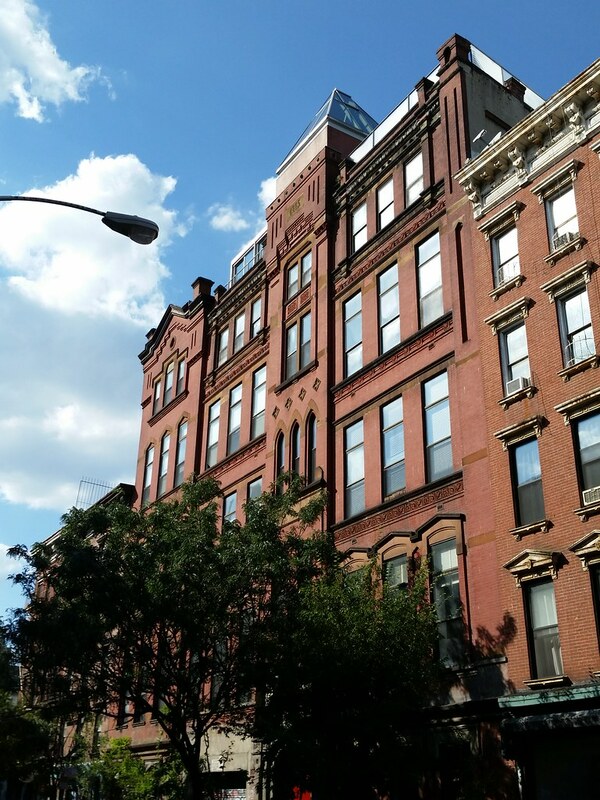 Built in 1885, the former Public School 79, "a rare example of High Victorian Gothic school design in Manhattan", has been converted into an apartment building. The name of the school is still faintly legible above the main entrance. Here's a bird's-eye view of the old school, which extends much deeper into the block than is apparent from the street. And here's a photo from 1920, shot from approximately the same angle as the one at the top of this post.